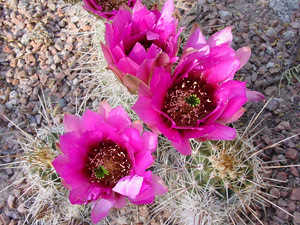 Description: The 3 inch (7.6 cm) wide flowers have darker centers and green stigmas. The fruits are red and fleshy. Ground squirrels and other rodents will eat the ripe fruit. The stems are covered in sharp, variably colored spines. The central spine is the longest and is at right angles to the stem and surrounded by shorter radial spines. The central spines are dark brown at the stem tips. 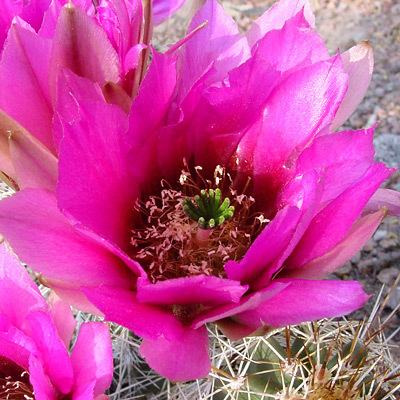 The similar Engelmann's Hedgehog Cactus (Echinocereus engelmannii) has 2 to 6 central spines per areole, while this cactus has only 1 central spine per areole.